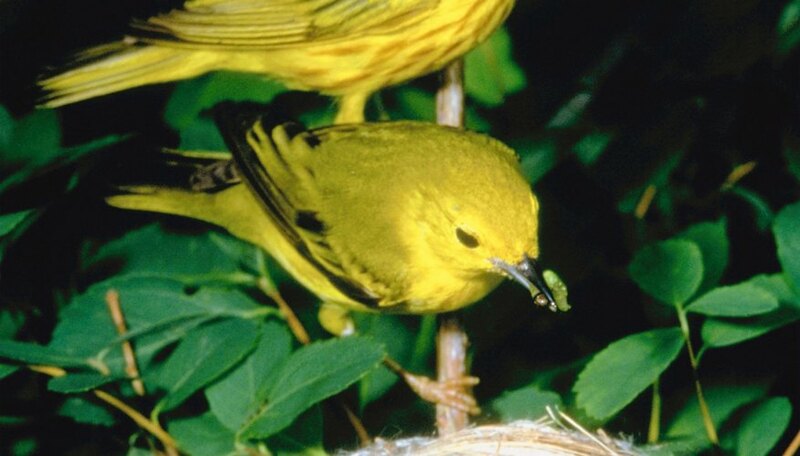 A realistic clay bird can be an important tool for teaching key characteristics of certain species. Clay bird models can be used to teach size, field marks, anatomy, pattern and color. Making your own clay bird model may take a considerable amount of time and effort, but is a great addition to any set of ornithological teaching materials and is sure to last a long time. Consider making a whole set for use in your classroom; don't be afraid to get your students involved. Buy some clay -- either natural clay or polymer clay is best, and both can be found at most art stores. For the most realistic model, use natural clay as it is easier to carve and shave, and results in a heavier, more durable piece. Polymer clay is lighter and less messy than natural clay and can be fired at home in the oven, but, because it is more plasticine than natural clay, it is more challenging to carve and shave. Decide what kind of bird you want to carve. Refer to reference pictures for help. Do a sketch of your bird, noting the size, shape and orientation of the body, head, beak, wings and feet. Take a piece of clay large enough to create the body of your bird. For something like a songbird, you will want to take a piece of clay a little smaller than your fist. Work it in your hands until it is soft and pliable. The clay should have no air bubbles inside. If there are air bubbles in the clay, they can cause the entire piece to explode in the oven or kiln. If the clay is too dry, wet your hand and pat it onto the clay, working the moisture in. If the clay is too wet, blot it with the a paper towel. Begin to shape your bird with your hands. For songbirds, start with something shaped roughly like a sweet potato. Make sure it has a body, a tail and a head with a beak. If your bird has a crest (e.g. Northern Cardinal), form it now. After you have formed the basic shape, use the utensils to perfect it. For example, use a paring knife to round off the head or square off the tail. Carve, shape and smooth until this main piece looks as accurate as possible. It should closely resemble the bird in shape and size, except without colors or details. Loosely cover it with plastic and let sit for one hour. Gently remove the bird model from under the plastic. The clay should be slightly drier and more solid than before, and easier to carve details into. With a sharp tool, add details such as feather texture, nostrils and the line between the upper and lower mandibles of the beak. With a dull instrument (like a dull pencil tip), make shallow holes for eyes. Press the tip into the clay just enough to form a small impression, deep enough to hold the black plastic eye. Usually the eyes lay in line with the bird's nostrils. Use a reference picture to determine where your bird's eyes should be. With the same tool, poke two larger holes in the bottom of your bird. Make sure the holes are a little bit larger than the plastic or wooden bird legs you have purchased; the holes will shrink after the piece is dried and fired. Make them deep enough to stably accommodate the top part of the legs (1/2 or 1/4 inch). Put the bird legs into the holes to make sure the bird can stand on them; if it is unbalanced, adjust the holes as needed. After you have added these holes, allow your bird to dry in the open air for at least three days. Fire your clay bird. If you have used natural clay, fire it in a kiln; do a "bisque" firing to prime it for glazing. 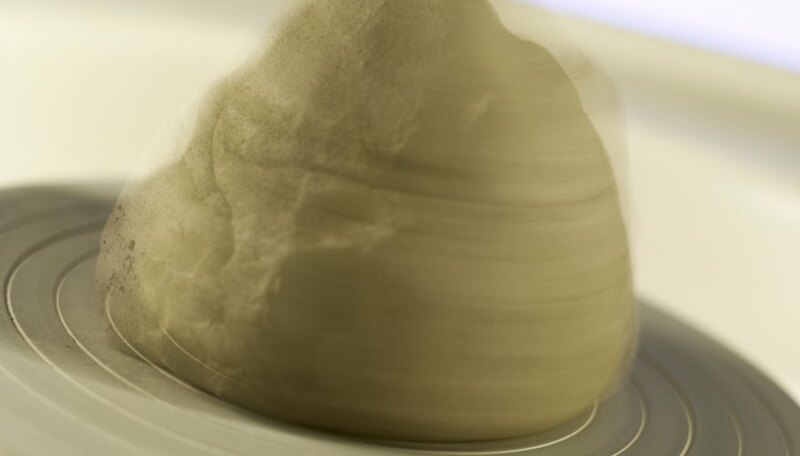 A bisque firing removes carbon and other impurities that can cause problems in glazes. Polymer clay can be fired in a home oven. Fire your bird as directed on your package of clay. Your bird should be bone dry before firing; if it's not, it could explode in the oven or kiln. After firing, allow several hours to cool. If your model is made from polymer clay, paint your bird. Use acrylic paint since it dries quickly. Refer to a picture to make sure the details are accurate. Seal with a clear acrylic sealant. Both spray-on and brush-on are available. 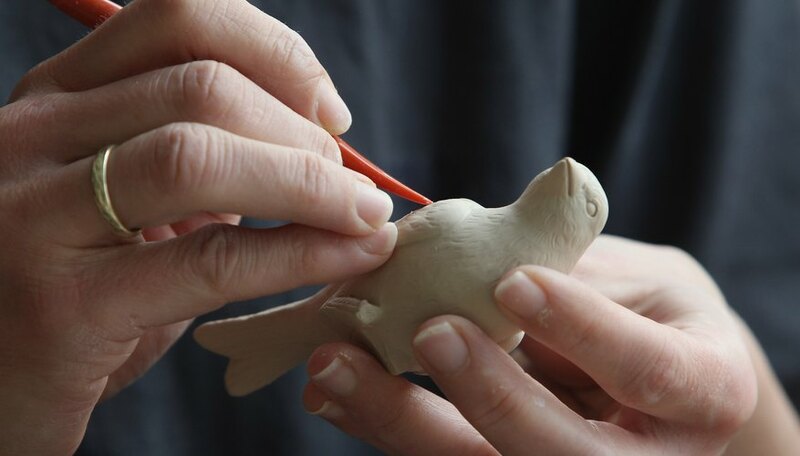 If your model is made from natural clay, liberally apply the colored glazes to the fired bird with a brush. Glaze for use on natural clay pieces is available in the clay section at your local craft store. Be as detailed or as general as you'd like; you can add more detail later. Allow several hours to dry. If your piece is natural clay, you will need to fire your model a second time. If you are firing several pieces at once, leave at least 1/4 inch between them since pieces can expand. Prop up your bird up with a metal stand or armature inside the kiln. Make sure the stand can withstand the kiln temperatures. Apply a glaze wash to the rack inside the kiln so that any dripping glaze can easily be cleaned off. Fire as directed on the package of clay or as the kiln manual dictates. After firing, remove your model from the kiln. It should now look glossy and colorful. Allow several hours for your model to cool. Add the eyes. Put a drop of craft glue into the shallow impression. Press the plastic eye into place and hold firmly for 10 seconds. Repeat for the other eye. Use black craft beads or buttons for the eyes, or purchase realistic bird eyes from online vendors (used in taxidermy and in wooden sculptures). Add the feet. Put a drop of glue into the leg hole, and press the top of the leg into it for 10 seconds. Repeat for second leg. Make sure the bird can stand and adjust the angle of the legs as necessary. Allow the glue to set before placing the bird permanently upright; wet glue can cause the feet to slide around. Plastic, wooden or even metal bird feet can be purchased online stores that specialize in animal carving. For metal feet, use a heavy-duty craft adhesive or even caulk. Another option is to use the plastic feet from of a bird purchased from a craft store; they are often used as wedding toppers or in wreaths.